Understanding who these Mughal personalities were is particularly important when we consider the vast number of Vaisnava temples they destroyed. Without this knowledge, one has the tendency to develop a false appreciation for certain aspects of art and style that are dovetailed with Vaisnava themes, but are really a glorification of the Mughal destroyers who desecrated Sri Krsna's abodes. As devotees, we do not glorify the beauty of the Taj Mahal, because we understand the suffering it represents. Similarly, when looking at paintings of Vaisnava themes that also include Mughal iconography, it is important to know just what it is we're appreciating. We have to understand the 'person' behind the 'thing'. There are a number of photographs of these personalities from the end of the Later Mughal period (1707 to 1857), when photographic technology became available. These pictures depict the Mughal courts during the dog days of their dwindling empire, are quite interesting to study. It is quite difficult, however, to rely on photographs when making the sorts of comparative studies of costume, architecture and ornament that we've discussed in earlier segments regarding the Mughal influence on Vaisnava art. These points of comparison are not as evident, primarily because an artist has not been free to stylistically blend the two cultures. The photograph simply records the person's setting, which is most likely going to be entirely Mughal. However, our comparisons in the field of art can still be made with respect to the Mughal leaders, their costumes, weaponry and courtiers, thanks to collections of paintings done by artists like Auguste Racinet, a 19th century French painter. In his epic book of cultural design, Le Costume Historique, a six volume edition published in France between 1876 and 1888, Racinet made an exacting study of the history of costume, dress, weaponry and paraphernalia, and personal appointment of many styles found in world history, from antiquity through the end of the 19th century. 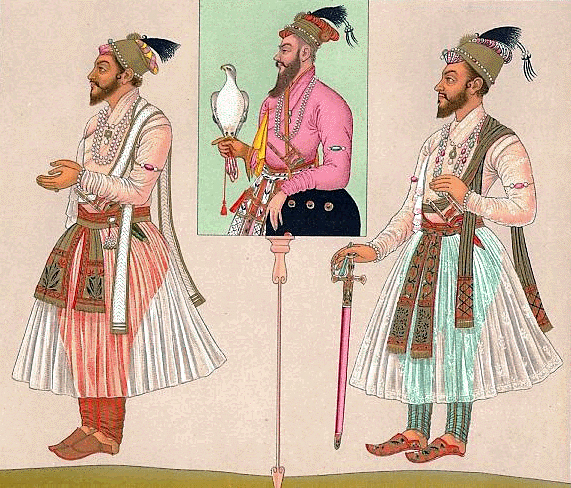 To this day, Racinet's brilliantly colored illustrations stand as a definitive study of the Mughal style. As art historians and curators know, Le Costume Historique is also a great source book to use when comparing traditional Vedic costume and iconography with styles coming from the Mughal influence in India, as they were depicted in paintings over the years. Over the next few segments, we will present a number of excellent illustrations from Racinet of the Mughal rulers. The descriptions of these Racinet illustrations are not a translation of the French text in 'Le Costume Historique', but rather come from the Encyclopedia Brittanica. 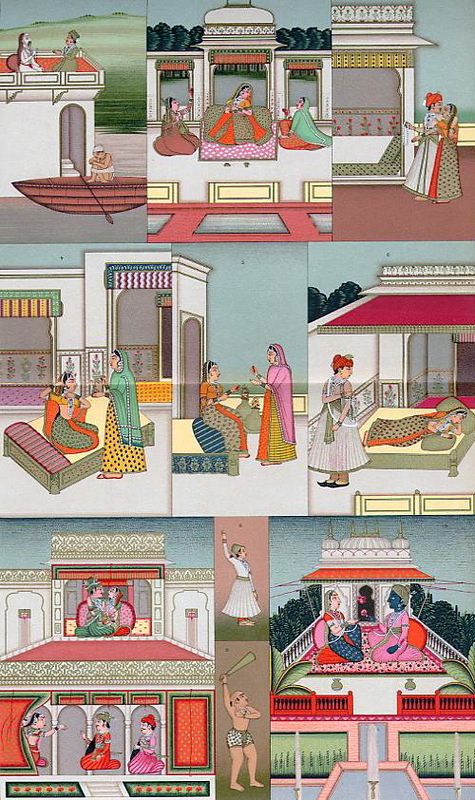 In the image above, "Mughal Interiors", we can see that Racinet has memorialized the fusion of traditional Vaisnava and Mughal themes in his depiction of Radha and Krsna, sitting on a Mughal-style terrace. In the description of 'Mughal Interiors', we find a very interesting phenomenon: all the panels are described, except the one depicting Radha and Krsna. Mughal Interiors: "Interior of a house - Terraces. Palace of a mogul emperor - An emperor's favorite. Gymnosophist - Gymnasiarch. Figs. 2,3,4,5,7 and 10 (indicated in the print) depict the terraces of a 'malh' of Djehanguir from the first half of the 17th century. This emperor, who had his principal residence at Lahore, built a gorgeous palace in Cashmere. Its vegetation and architecture united in what was called paradise on earth. Fig. 6 Represents a nuptial room where Sher Afkan is taking away a pearl necklace, the symbol of yoke. Fig. 1 shows a conversation between Djehanguir and one fakir, 8. Shows a dancing dervish, 9. A gymnasiarch, dressed in under shorts, ready for a fight or various exercises." One can only wonder if the reason for this omission is that the scholars writing the text for Brittanica did not want to specifically point out that Vaisnava themes of the Lord's pastimes had been co-opted into the Mughal style of paintings. Nor is mention made of the fact that many of the interior scenes are obvious replications of classic Krsna lila scenes with the gopis. In fact, the Mughal rulers regularly directed their court painters to duplicate scenes of Radha and Krsna's pastimes, replacing the Lord and His consort with images of themselves and their consorts. We can understand why the Brittanica might shy away from including this line of discussion in their encyclopedia. The illustration above of Babur's army is taken from the Racinet's presentation on 'Military Costumes of India - 16th Century'. "These fragments are taken from a 16th c. painting representing Djahir - El-din Mohammed, Babur nicknamed (the Tiger), the king and emperor of India, leading at the head of his army to invade the province of Mazindera, in Persia. In this print, the Mogul is represented with all the attributes of the ruler, especially the parasol, carried over him. He is wearing a silk jacket, short sleeved, and a round shaped skirt, with ornamental design and large metal button-plate on his chest. The jacket is padded to protect against the arrows and his knees are also protected by metal plates. In his right hand, he is holding one of the offensive weapons of the time, a spear, with ends being finished with decorated metal, on the left side he wears a saber and on his belt, a quiver with feather arrows is attached. The soldier behind him carries a hammer like weapon, which could also be a heavy wood club. He is holding it with both his hands, indicating the heaviness of the weapon. The mogul's horse is entirely protected with armor of overlapped blades. An interesting feature is that he does not wear the rider's boots, but his personal slippers. Another interesting feature of this painting is the lack of elephants in his army. Before the ruler, we see a number of infantrymen who proceed him and by shouting, create the necessary room for him to pass."